Even though the longest shutdown in U.S. history is over, its impact continues for many immigrants who are awaiting court dates. California immigration courts canceled more than 9,400 hearings over the course of the shutdown, according to an estimate by the Transactional Records Access Clearinghouse (TRAC) research center at Syracuse University. New York ranked second with more than than 5,300 cancellations. The cancellations contribute to a backlog that was already at more than 809,000 cases as of the end of November, according to TRAC. 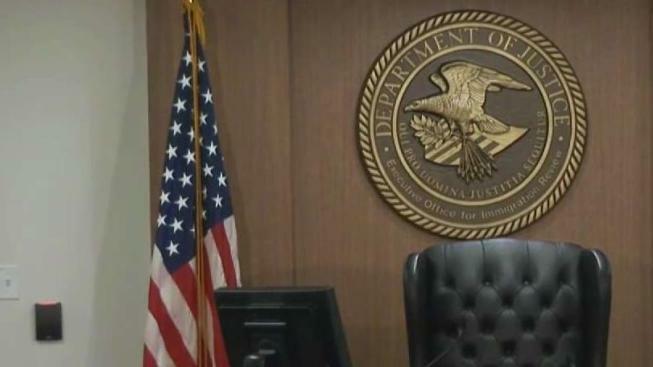 San Diego immigration attorney William Baker said immigration court looked like a ghost town on Monday compared to a typical day when rooms are filled with those waiting to see if judges will grant them permanent status or if they would face deportation. "For people waiting to go to court, it leaves a lot of uncertainty and stress in lives," Baker said. As many await hearings, a shelter at the Normal Heights United Methodist Church in the city is at full capacity for asylum seekers. "We're above and beyond but how do you turn down a pregnant mother and kids?" asked Jeannetta Kramer, office manager of Normal Heights United Methodist Church. The church provides them with clothes, shoes and a place to stay while they wait for their court hearings. “The usual stay is two months but, it varies," said Kramer. The church also provides asylum seekers with transportation to and from their court hearings. Lázaro Rodriguez, 47, an asylum seeker from Cuba, has been staying at the shelter for one week. “I came to the U.S because it’s very hard to live in my country because it’s communist,” Rodriguez said. Rodriguez added his American dream would be to get a house and have a family. Most asylum seekers in this shelter are from Russia, Ukraine, Brazil, and Haiti. Since the government reopened, the church has seen an increase in asylum seekers coming through their doors. “As of today, we have quite a few people coming in,” Kramer said on Monday. The church had to start a shelter as they saw an increase in asylum seekers coming through their doors. In 2016 there were up to 5,000 asylum seekers who asked for their services. Many immigrants fear that they will not get a new court date in the next three weeks, a timeline President Donald Trump gave Congress to come to an agreement before another government shutdown would happen.